A meeting of the Roxbury Historic Preservation Commission was held October 15, 2016, at 10:15 a.m. at the Roxbury Town Hall. Present Lewis Wendell, Chairman, Commission Members Nicole Haroldson and Doug McLaurine. Also present Carolynn Faraci, Commission Clerk. Wayne Bank has not submitted their application on Phase Two for the sign on the front lawn. Doug McLaurine asked questions about the work he will be doing after the purchase of Jerome Liberatore Property located at 53587 State Highway 30, Roxbury, New York 12474. 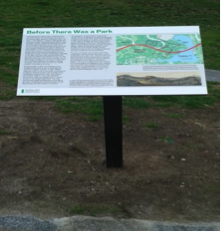 Kingdon Gould and the O’Connor Foundation each provide Five thousand for the five historical signs to be placed in Roxbury. The signs will be located at Roxbury Arts Group, Enderland, Roxbury Railroad Depot, Jay Gould Memorial Reformed Church and Family Home (5005 Vega Mountain Road). There will be paper maps showing where the Historical signs will be placed in the Town of Roxbury.